The New Yorks Knights bid to win the US Chess League was stopped cold last night by the Boston Blitz. Board One, the battle of former US chess champions, Hikaru Nakamura for New York and Larry Christiansen for Boston, was the first game finished; it was a hard fought draw. Then Iryna Zenyuk, the hero of the Knights this year, couldn’t continue her winning ways and went down to her first defeat of the season on Board Four. 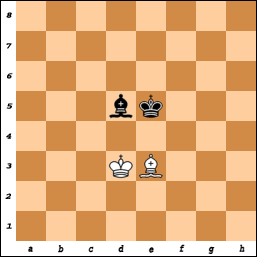 he shifted his rook to g7, a logical-looking move, training the queen and rook battery on the White king. 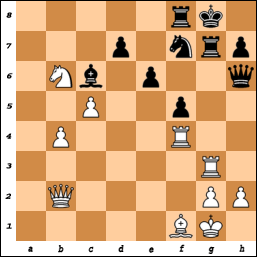 But White can then defend by retreating his bishop to f1. Black’s position, of course, is still strong, though. 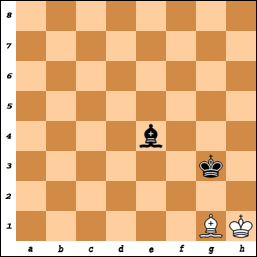 When I joined all the Knights for a gallows-humor post-mortem afterward, Pascal realized that on move 29 he should have penetrated with his queen to d2 so that he is forking White’s bishop and b-pawn. 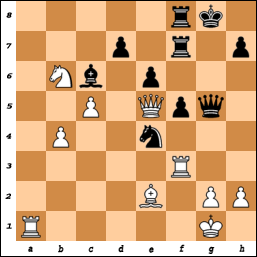 Later Pascal had blundered into the position shown below, in which White, on move 35, has a cute, decisive shot. Can you find it? The shot is Rh4, attacking and winning Black’s queen. 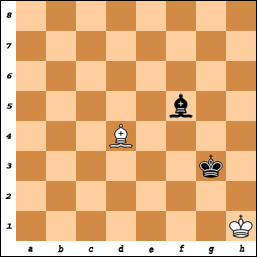 The undefended rook is immune to capture by the queen because then White mates on g7. After Rh4, the French Canadian showed his excellent command of English by uttering a choice expletive. With Pascal’s loss, New York was down two games, and would lose the match no matter what happened in the sole remaining encounter, between “Sleeping Knight” Jay Bonin and Denys Shmelov. Bonin, in fact, probably had a losing game because Shmelov was up material and had too many pawns. To the delight of his teammates, Bonin ended up swindling Shmelov by weaving a mating net and dangerously advancing his one foot soldier. With the Yankees and Mets disgraced, the New York Knights hope to restore the Big Apple’s winning way by demolishing the Boston Blitz tonight in the United States Chess League. Hikaru Nakamura, on Board One for the Knights, has made public his plan to “crush” Beantown’s Jorge Sammour-Hasbun. My advice to Jorge is not only to brush up on irregular chess openings but also to review simple endings. Because then Hikaru will mate you! Nakamura, who was apparently watching football as well as the World Championship, played it cool and did not respond. Just as well because it turned out that the sophomoric kibitzer wasn’t Christiansen, my sources say, but someone impersonating him (a Boston Blitz teammate, perhaps?) who had access to his user name and password. My memoir King’s Gambit: A Son, a Father, and the World’s Most Dangerous Game is full of amusing examples of players’ misbehaving. The book has been out less than a week, and is still available at a special introductory rate at Amazon of 34% off.